In the years leading up the Second World War, a gigantic, around 630 km-long defence line was built from the Netherlands to just before Basle in Switzerland – known as the West Wall, or Siegfried Line. 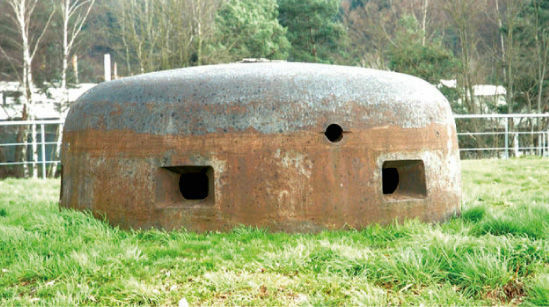 22,000 bunkers and fortifications were planned, of which around 14,800 were actually built – including 32 so-called B-Werke. The B-Werke were among the biggest and strongest bunker complexes along the Siegfried Line and were only built at strategically important points. The B-Werk in Besseringen, built in 1938/39, is the only intact structure with all armoured cupolas left. The B-Werk Besseringen was so constructed that a force of 85 – 90 soldiers could keep up the battle unaided for up to 4 weeks. The edifice reaches three storeys deep into the ground; on the surface only the sentry and the gunrooms can be seen. Inside, 44 rooms housed the crew, provisions, weapons and ammunition. A presentation underlines the memorial character of the B-Werk, impressively documenting persecution and resistance, as well as civilian losses. Last entry is at 5:15 pm!